Home Calendar Join our Volunteer Program! Enjoy meeting new people? Love espionage? Are you outgoing? Come join our inaugural class of volunteers before we move to our new home at L'Enfant Plaza. Our volunteers will be the first to experience this new and expanded vision of SPY and will play a vital role in establishing a robust team of community members dedicated to service. Welcoming guests as they begin their spy adventure while helping them plan and organize their visit. Preparing guests for Undercover Mission tours before getting started with staff. Engaging guests in the permanent exhibit. Thanking guests for their visit and ensuring successful missions. Joining a long tradition of giving back to the local Washington, DC community. Providing a critical role in the visitor experience and reputation of the International Spy Museum. Professional development opportunities and Museum sponsored field trips. Two free tickets to the Museum before it closes at F Street. 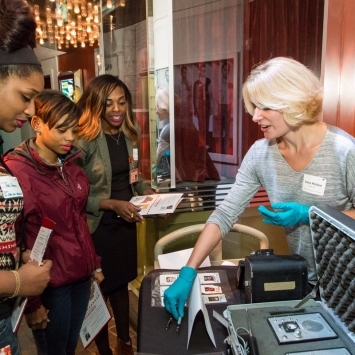 Exclusive previews and tours of the new Spy Museum at L'Enfant Plaza. A Volunteer Appreciation Event in 2019. Interested? Fill out the online application HERE.